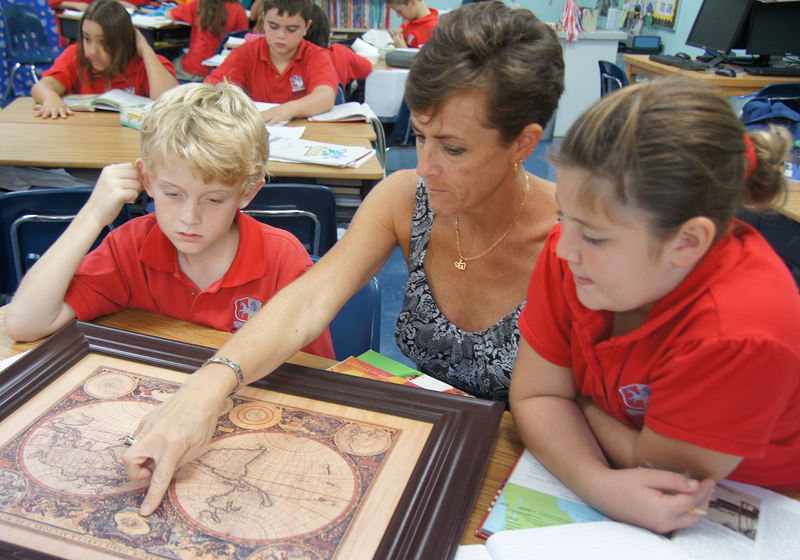 Lower school teacher Jill Kittredge discusses 15th century maps with her fourth grade social studies students. Educational choices have become increasingly complex. Gone are the days when families carried little stress about where to send their children to school, simply because the town had only ONE school option. Yesteryear has passed, and along with it, the parental peace of mind that came from providing the best (albeit only) educational option available. Today, families are bombarded with messages surrounding academic achievement, college placement, alternative methodologies, and magnet programs. Each school promises a path to what every parent wants: a happy, well-educated child, ready to face any challenge his or her future holds. So how does a family choose? Statistics are clear that independent school children are more likely to attend college and hold successful careers. However, what can’t be marked by statistics is the difference that a values-based education makes in the life of a family. The mission of our school, Grandview Preparatory School, in Boca Raton, Florida, is like that of many small independent schools across the nation. Specifically, the mission combines modern thought with timeless ethics. The modern thought aspect is fairly self explanatory. Any school worth its salt seeks to provide its students with the best thinking available. While curriculum and methodology are important, in order to produce wisdom, something else is needed. Any school can instill knowledge, but knowledge alone is not wisdom. Independent schools like Grandview focus on what information we want students to know, with the added element of asking students to use that information for the greater good. For example, memorizing the preamble to the Constitution does little good if students do not understand the purpose behind creating a Constitution in the first place. Every learner needs both both the big and the small pictures. Which brings us to the most distinctive aspect of the small, independent school mission: timeless ethics. Things in the world around us change all the time. Governments rise and fall, new scientific discoveries are made every day, and textbooks are outdated the moment they are printed. With that being the case, how can anything, particularly ‘ethics’ -which are really standards of human behavior, be ‘timeless’? Despite a rapid and constant state of change, there is something about each of us, and about our human experience, that is timeless. Regardless of any religion, or any particular set of beliefs, there is that part of us guided by some sort of compass, telling us about right and wrong. We work hard as families to teach our children this from a very young age, but our modern world overwhelms us with options. The one room schoolhouse is no longer the only educational choice. To help our students understand why they are in school in the first place, we need to point to this compass, this link to that which is timeless. Independent schools do not believe that the endgame of the entire educational process is a degree simply because it leads to financial success. While everyone agrees that financial success is wonderful, the true endgame is to leave the world and those we love with something of value beyond money. As parents, we know our lives have meaning when we use our brains to follow our heart. The truly wise seek to better ourselves, our families and our community with the work that we do. Right now the ‘work’ set before our children is the stuff of learning. There are intellectual things they must learn, and there are social and emotional things they must learn. The core curriculum for social and emotional learning is the development of the moral compass. While we can understand from a book that it is not right to bully, we can only truly understand that principle in a community where it is practiced. Values can’t exist in theory. They must be practiced in context. Communities, not institutions, can provide this context. Ethics are practiced generationally in communities. Traditions and ceremonies become timeless because they tap into our moral compass to remind us that this moment shall not go unnoticed. We build community by celebrating what is important to us. At independent schools across the nation, the staff and parents play an active role in teaching more than curriculum. The size and mission of our schools keep the focus on relationships, because only relationships teach that which is timeless. All other knowledge is mortal. Our moral compass develops from those we care about and those who care about us. It is personal, not academic. It is everything emotional, creative, and intangible. This compass cannot be nurtured or developed by strangers. Scientifically, an actual compass is an instrument perpetually aligned with magnetic north. No matter where an individual stands on earth with a compass, the needle will point to the north pole. Similarly, our human, internal compass always pulls toward the values of our parents, our friends and our community. Educational institutions that are too large, too overburdened with the programs they provide, lose alignment. The pull is not toward the higher ground, not toward values, but toward simply organizing the masses. The small, independent school choice matters because independent schools, and the students we serve, stand for something above academic achievement. We stand for each other – something we couldn’t learn on our own, or in a crowded lecture hall, known only by a student ID number- not a name. Tags: compass, educational choices, Grandview Preparatory School, independent school, private, values. Bookmark the permalink.